Both my kids have been begging me for months to be allowed to get on Facebook. Hubby and I both were not huge on this idea, feeling it is just not safe. I trust my kiddos, but I just don't think either one of them is mature enough to handle that yet. They are children after all and kids aren't exactly known for having the best judgment. I was recently selected by Mom Central as a YourSphere Test Drive Mom. Myself, along with 50+ other wonderful moms get to test drive Yoursphere.com, a safe place for kids to test their social networking wings. 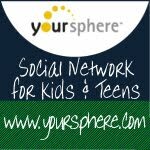 Yoursphere is a mom created site that verifies the identities of all those on the site. Check out this video to learn more about why Yoursphere was created and how it works. Tristen and Ashley are both all set up on Yoursphere and having a blast! It was fast and easy to get verified and all our accounts set up. The Parent Dashboard is a great feature that allows you to see what your kids are doing on Yoursphere. I love that I know everyone on the site is who they say they are; there is no worrying about impostors getting through on the site. I finally feel that my kids are safe on a social networking site. The kids love all the different Spheres they can join, on topics from books to sports. There is lots to do on Yoursphere and they can even create their own Spheres for what interest them. I can safely say my kids aare really enjoying check the site out! If your kids are interested in social networking sites, but you aren't comfortable with the idea, you might want to give the site a try. Yoursphere is completely free to use. If you and your kiddos would like to check it out for yourselves, please sign up with code: YSMC-0049 and let them know Ramblings of a Texas Housewife sent you. "I wrote this review while participating in the Yoursphere Test Drive program by Mom Central on behalf of Yoursphere. I received a free lifetime Gold membership on Yoursphere.com, Yoursphere t-shirts, and a $50 American Express gift card to facilitate my review." I don't even facebook girl. So, why should I let my kids. My blogging yes I do it but I don't put my kids out there if you know what I mean. I use it for design purposes.